Cheap Acrylic Sheet Cut To Size in Melbourne at Industrial Plastic Solutions. Cheap Acrylic Sheet Cut To Size in Melbourne as well as Perspex® sheets which come in a enormous variety of colors and thicknesses which nowadays is used for an infinite number of applications such as, Brochure Holders , Cake Stands, Scientific Equipment, Point of Sales Displays as well as Trophies and general Acrylic Displays. Acrylic is available in Rod. Sheet, & Tube. Industrial Plastic Solutions also supply Plexiglass upon request. Most sheets are supplied in a great variety of transparent, translucent, and opaque colors as well as colorless transparent. The material is also supplied in a number of surface patterns such as Frost, Slumped, Matt and Arctic Ice. Acrylic sheet is considered a better insulator than glass with a 10% lower heat transfer value. Acrylic sheet is half the weight of glass. Acrylic offers excellent weather resistance as compared to other types of plastics. Deterioration due to sun, cold, sudden temperature changes, salt water spray, etc., are avoided due to the inherent stability of acrylic. Acrylic sheet is able to be formed into a vast amount of shapes to suit many applications, by either vacuum or blow forming as well as drape forming and strip heater bending. Acrylic | Perspex may be cut by sawing or routing with power equipment saws or by scribing and breaking. Acrylic & Perspex sheets come in a variety of thickness and sizes. 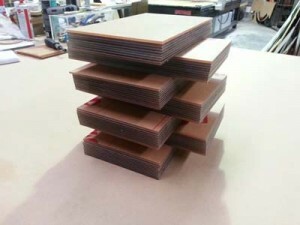 Standard Sheet Sizes are 2440mm x 1220mm and comes in thickness ranging from 1.5mm – 50mm thick. 1.5mm, 2.0mm, 3.0mm, 4.0mm, 4.5mm, 6.0mm, 8.0mm, 10.0mm, 12.0mm, 15.0mm, 18.0mm, 20.0mm, 25.0mm, 30.0mm, 40.0mm, 50.0mm. Please note over-sized sheets are available upon request and may only be available in certain types of thicknesses, please feel free to call us for availability and price. Silver Mirrored Acrylic Sheet is available in 2mm and 3mm in standard 2440mm x 1220mm. Gold Mirrored Acrylic Sheet is available in 3mm standard sheet size. A wide range of Acrylic Tints & Fluoros are available for Point of Sale Displays. Shop Fronts and Art Projects as well as the Architectural and Marketing Industries. Call us for a free quote now on (03) 9798 1153.